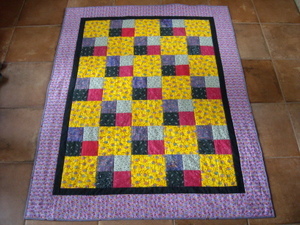 I've been working on the crumb quilts again recently. The blocks above are the lightest of the crumb blocks that I made in my marathon a few weeks ago. I'm having fun putting the puzzle together and finding extra strips to make things match up. I'll probably keep playing with the arrangement until it's put together. Here's another possibility. Meanwhile, last week I made good progress on this crumb quilt. I like the red sashing and blue intersecting squares. I think I'll add more red for a border. This one is a bit more controlled than the one above. 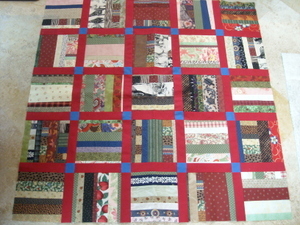 I still haven't forgotten that I wanted to make a crumb quilt with cheddar borders. 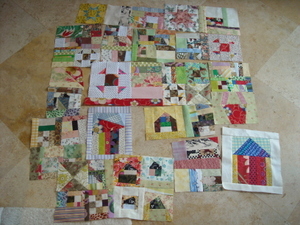 I have another set of blocks that I have planned to use with the cheddar. We marveled at the eclipse of the moon last week. There are lots of better pictures of it out there, but I was impressed that my little camera got anything at all. There was a perfect view right from our courtyard. It was another busy weekend. We finally had Chloe's pool party for her birthday (Chloe decorated her cake so it would be just right) and last night was Mom's Night Out. This time I got to learn something from some of the other talented moms. We did beading and I repaired a bracelet and also made a pair of earrings and a bracelet to match. It was a lot of fun and the food was excellent once again. 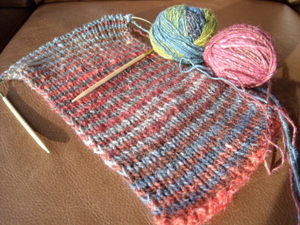 I started a new sock yesterday. 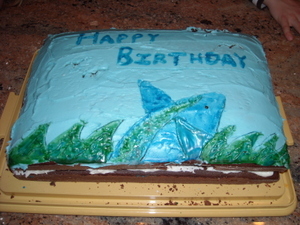 I needed a totally plain vanilla one to carry around. I've been working on my Jaywalkers, but even that simple pattern gets screwed up if I'm talking to people. I've also been working on Rogue! It's really coming along now. I'm on the hood now, sleeves all done. When the hood is done I will only need to sew the sleeves in. I can't wait! Finally, My goal in life is ready for its close-up. I really had fun making this one. It was a pretty quick project once I figured out how I wanted to do it. 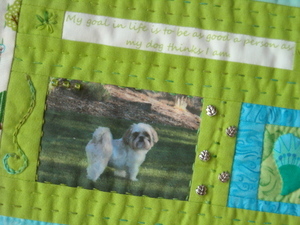 I used the Printed Treasures fabric that you can put right through your printer to make the photos of Scrabble. I inserted the photos into a Word document and then added the text to the same document so it would all print out on one sheet of fabric. The fabric is pretty expensive, but a good starter project. I actually went to the store looking for Bubble Jet Set, but they only had this and it worked out fine. 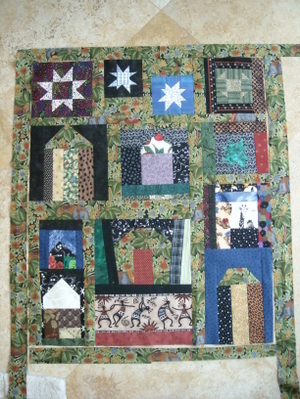 I decided to quilt it with big stitch embroidery because I was running on a deadline. 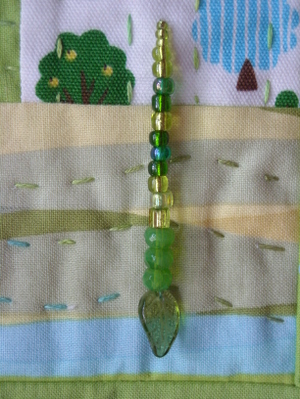 I also did little bits of other stitches such as chain stitch, lazy daisy, stem stitch and feather stitch. I even did some of Jude's dot stitches. Lastly, I added the buttons and beads. 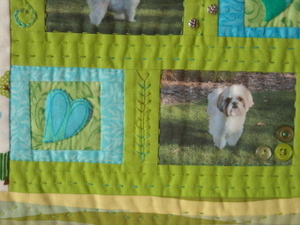 I've been wanting to immortalize Scrabble in a quilt for a while. 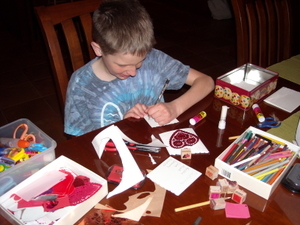 I still like the idea of putting a folk art style applique image of him on a quilt. 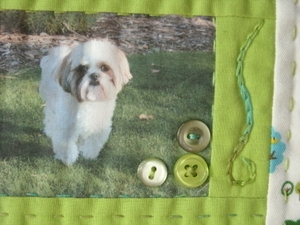 Gwen Marston has a quilt done like that of her dog in one of her books. It's always been a favorite of mine. Perhaps, some day! 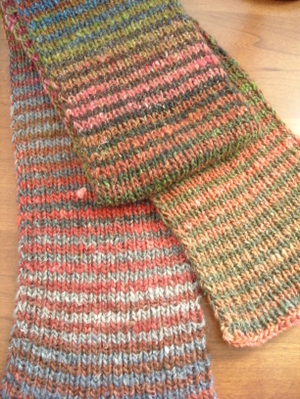 I finished the Noro stripes scarf last week, but finally had a moment to take some photos. 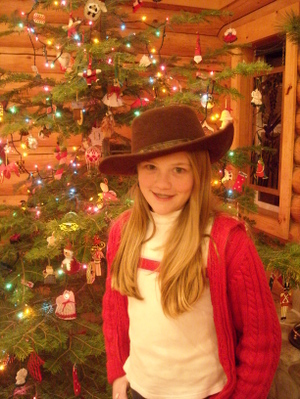 This one only took a week to knit, a record for me! I don't know what it was, perhaps the fascination with the changing stripes, or the pure mindlessness of the pattern. Anyway, I really like this one. I love how you can take two seemingly mismatched balls of yarn and get something so good looking. I think this one would look great on men or women even with the pink and green sections. I think there may be more of these in my future. Last week was so busy and really exhausting for me. I'm starting to feel the radiation fatigue. Other than that it's going fine. I have to make myself rest more because I'm used to running here and there. 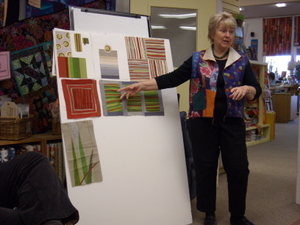 Anyway, the class with Jean Wells, Intuitive Quilting, was an eye-opener for me in the color theory department. It was really good to see how Jean thinks about color. I'd admired her free pieced quilts recently and now that I understand where she's coming from, color wise, I can see I have so much to learn. 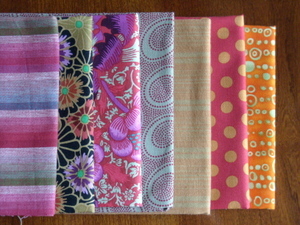 Our first task was to randomly select 5 strips of fabric from a stack that she supplied. I was the last one there, so I got the dregs. These are not my favorite colors, but I had to make do. We arranged them according to what we thought was a value gradation. Then Jean brought out the red plastic value finder. I have known about these things for years, but never tried one. It really was quite amazing to see how we all had our fabrics in the wrong order. 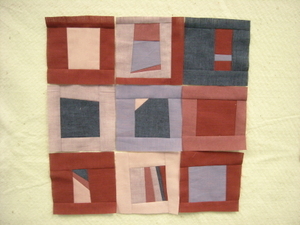 Once we figured out the true value gradations we were to make these free pieced squares. We had to combine the values in different ways such as light center, dark border; dark center, medium border. After making 4 of those we made the rest in whatever fashion we wanted. Now, this is my kind of piecing. 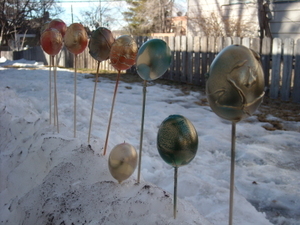 I had lots of fun with these and it went quickly. I think I'll probably finish this into a mini quilt sometime. Next, Jean showed us how to do these gentle curves. I had tried this technique last year with great results. One thing that was new to me was the technique for adding the really skinny strips. If you click on the photo above you can see the little blue strip on the left and the tiny red piece inserted in it. That was fun to do. Jean showed us how she develops her color ideas. My favorite illustration of this was the one above, in the first photo. Here's a better look at it. 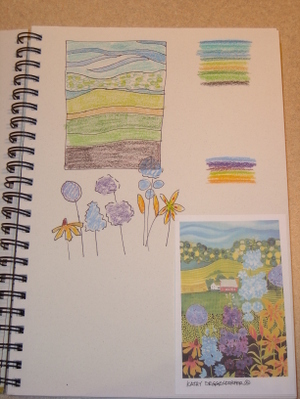 Jean says she often gets her color ideas from fabrics (especially Kaffe Fassett prints), photos, paintings, and magazine illustrations. She has a design notebook full of clippings and such. 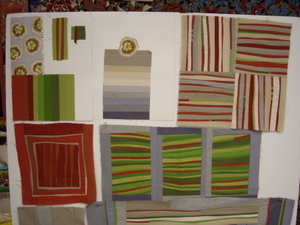 Here she took the colors in the fabric in the upper left hand corner and separated them out in solids (see the reds and greens just below and the grays in the upper middle. 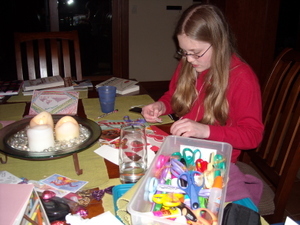 Then she tried emphasizing the various colors- red, green or gray. I love the different effects and can see how exciting it is to play around with these ideas. 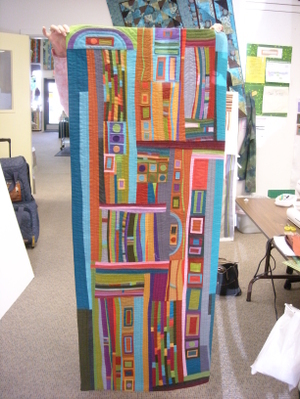 Next she talked about her method of designing a larger quilt based on a sawed off tree trunk. 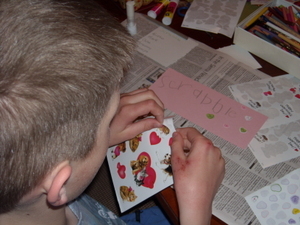 She had the photo and to provide the color she went to all the clippings you see here on the left side. 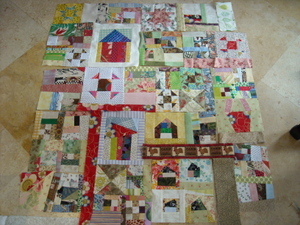 The mini quilt is a smaller study to prepare for the larger quilt. 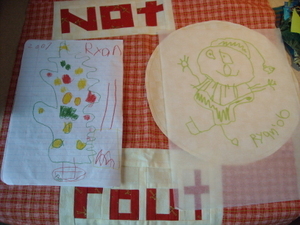 This one was not free pieced because she wanted it to look exactly like the tracing she did of the photo (upper right). This is the nearly completed top. 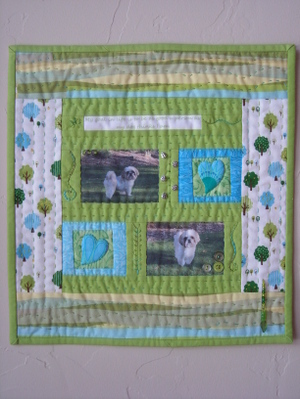 I got some photos of some other quilts done in the free pieced style. I really love these and the colors are so inspirational, though the photos don't do them justice. I like the subtle curves and surprising little bits of color. 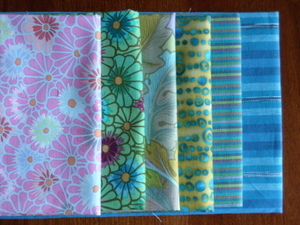 This one is all solids which makes me really want to just focus on color this way and not have to worry about pattern. Jean took a class with Nancy Crow several years ago and that's when she started working this way. One of the assignments she had in that class was to work in black and white and that was the ultimate test. Taking quilting right down to the bare bones. She showed a photo of the black and white study she did (I don't think it was ever sewn together) and it was quite striking. 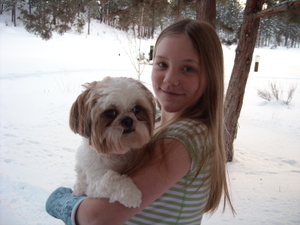 She thought it reminded her of a nearby burned forest area in the snow. 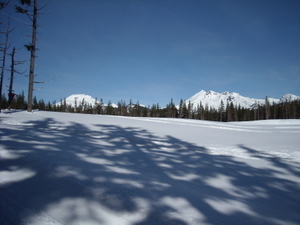 Blackened trees against a field of white. This one has a few prints mixed in with the solids for a nice effect. On the second day we were given free reign to try any of these techniques. I decided to develop a page in my brand new design notebook, courtesy of my sister, and used a greeting card for inspiration. 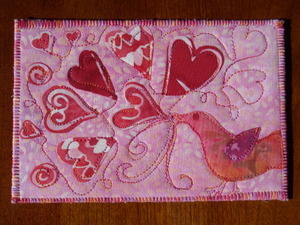 I chose this one for the colors and the design lines which would call for some curved piecing. This is as far as I got during class. Jean has kindly offered to have a follow-up class next week, so I hope to get a little more done on this before then. 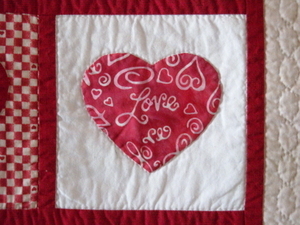 The last thing we discussed was how to finish a quilt with asymmetrical edges. I like this facing technique and will be giving it a try sometime soon. 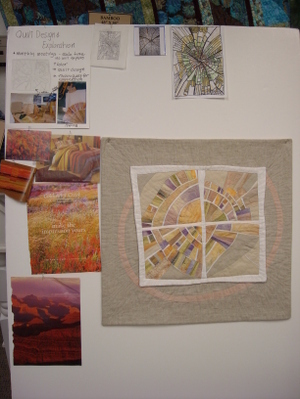 I think it's the same idea as what is presented in the Art Quilt Workbook, but I didn't understand how it worked until seeing it in person. 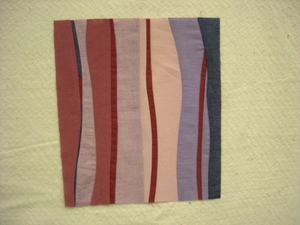 Jean also showed us some really great free motion quilting samples that gave me some ideas. It was an exhilarating class that left my mind reeling. I have so many WIP's right now that I'm feeling overwhelmed. Luckily, I got the beading done on Chloe's quilt today and have only to add the sleeve. Photos to come soon! 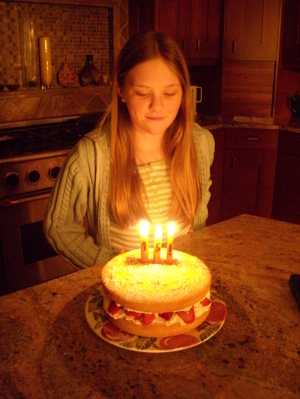 Thank you so much for the birthday wishes for Chloe. She had a wonderful day! Her cake was a joint effort by she and I. I baked the layers and she decorated with whip cream, strawberries and a dusting of powdered sugar through a cake stencil. 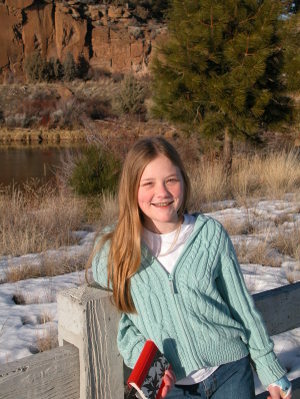 She also made the 15! candles last fall when she was making beeswax candles. 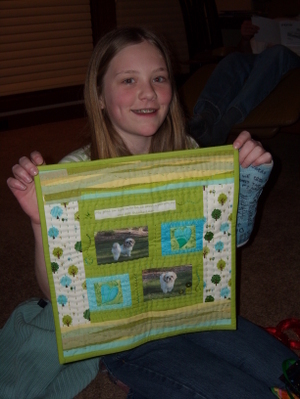 My big surprise for her was this mini quilt showcasing Scrabble. Better photos to come soon. I managed to almost finish it on the day of her birthday. 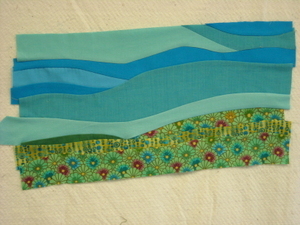 I got it all done, down to the binding. I still have to add a hanging sleeve and will embellish with beads. There's a quote there that says, "My goal in life is to be as good a person as my dog thinks I am." I asked her for her favorte dog quote and had her look at a basket of fabrics and tell me which were her favorites. That's how I got the color combo I knew she would love. She had no idea what I was making. Stay tuned for better photos of this quilt! It's been a crazy week what with selling Campfire candy. Luckily, Chloe has met her goal of 300 boxes and we have just a few more people who want some. Thank goodness it's done for another year! If you've never had to do this before it involves long hours sitting in front of grocery stores waiting to sell candy. 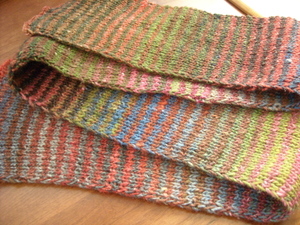 I needed a quick, mindless project and found one when I went to Norma's blog last week and saw her stripey Noro scarf. 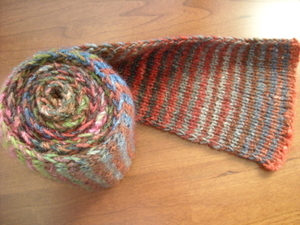 I had some Noro Silk Garden hanging about in the stash so I started this last week. It's already almost done. I love this pattern originally seen on Brooklyn Tweed, probably the most gorgeous knitting blog out there. 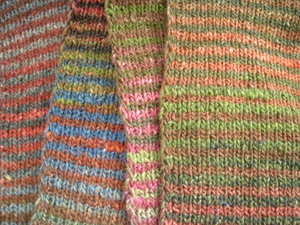 You can take two different balls of Noro that you'd never stick together otherwise and get a really smashing scarf. A complete scarf photo should be available any day now. One last thing to show you. 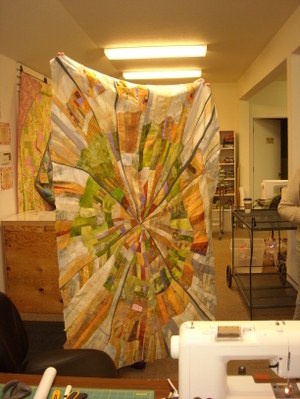 I managed to machine quilt and bind this quilt this morning just in time for quilt guild tonight. 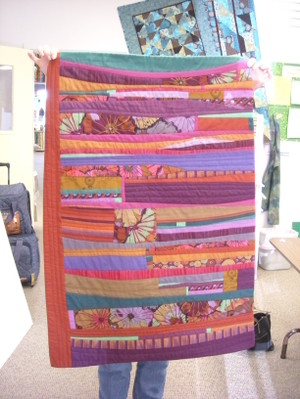 This was available as a kit from the community quilts group in our guild. My friend, Michelle, offered to piece the top. Then we basted it together and I did the finishing. I'm so glad it's done! And now I'm off to the guild meeting!